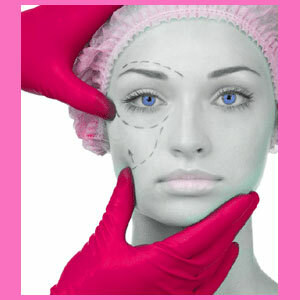 A thread facelift is a minimally invasive approach to rhytidectomy, which avoids open surgery in exchange for an alternative technique. Thread lifts utilize special barbed sutures, which are literally sewn through the facial structures in order to hold up skin and underlying tissues, pulling the face tighter and eliminating ptosis and wrinkles in the process. Thread lifts are becoming popular for both area-specific facial lifting, as well as overall facial enhancement. This guide explains the process of permanent suture facial lifts and how they can improve the aesthetics of the face. Contour thread lift uses unidirectional barbs to hook and pull tissue into the desired location. Aptos thread lift, also known as the Featherlift, uses bidirectional barbs to treat the tissue from all angles. Both of these technologies are used throughout the medical industry for a great number of cosmetic purposes. Thread lift is not indicated as a replacement for a full facelift, nor will it achieve anywhere near the results of rhytidectomy surgery. Thread lifts only take a short time to perform and can sometimes be done under local anesthetic. There are open versions of the technique, as well, but these are usually integrated into a more involved surgery, such as a brow lift, rather than used as stand-alone procedures. Facial pain or muscular dysfunction. Threads may break or detach, creating facial asymmetry. Results may be poor, especially if the patient is not an excellent candidate for the technique. The “one hour facelift“, as it is often called, is a terrific option for men and women who are just beginning to notice the effects of age and degeneration on their skin. Thread lifts will help tone and tighten the facial structures and will raise drooping skin and underlying tissue conservatively. Do not expect drastic results, but do expect a refreshed and more vibrant appearance. Remember that thread lifts require considerable experience and skill to perform, so it is always advised to seek out a specialist, when considering either treatment approach. Going to an inexperienced surgeon will provide the ideal opportunity for the worst possible results to take place, which is a situation you would do well to avoid.